Let's get this out of the way first. . .I'm a huge X-Files fan. I'm even going to step outside of the box of nerdly comfort and openly declare that I even like the seasons with Agent John Dogget. Yeah. . .I said it. Not every episode was great. I'll admit that there are some that are nothing but filler and "Monster of the Week", but when the show hit the mark, it NAILED it dead center. But THAT'S the T.V. show. I'm here to talk about comics. In particular, the 41 issue Topps run from 1995 to 1998, which coincided with the 2nd through 5th season of the T.V. show. So let's get to it, shall we? 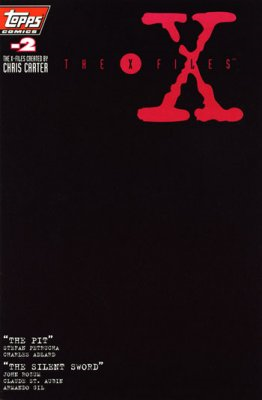 Before we get to the main ongoing series, let's start off with 4 "special" one-shot issues that precede the first issue: -2 (reprinting stories from X-Files Magazine), -1 (polybagged with Hero Illustrated), #0 (adapting the pilot episode of the T.V. show) and #1/2 (A Wizard Magazine mail in offer). Of the two stories, the first is the better. "The Pit" is about mysterious goings-on at Oak Island's famous money pit. There's not much to it, but the dark and moody art by Adlard (showing a definite improvement over early issues of the ongoing) sells it quite nicely. The second story, "The Silent Sword" deals with a haunted samurai sword and is pretty forgettable, with art that is pretty much 90's superhero style and not really a good fit for an X-Files story. This short comic was originally polybagged with Hero Illustrated #21 back when comic companies did cool things like that. . . It deals with Mulder and Scully investigating an artist whose models keep disappearing. He insists it's aliens but ends up in prison, where he himself is abducted. Overall not a great story. It's all really a tie-in promotion for a set of new Mars Attacks cards Topps was putting out. Adlard's art isn't good here either. . .he completely fails to capture the likeness of Mulder and Scully. In this adaptation of the pilot episode of the X-Files T.V. show, F.B.I. Agent Scully is assigned to assist/spy on Agent Mulder during his investigations of the "X-Files" (cases deemed strange and unusual by the F.B.I.). Their first case together involves a series of unexplainable killings in the Pacific Northwest. Mulder believes extraterrestrials are to blame, while skeptic Scully believes a serial killer is responsible. Turns out both are right when the killer is revealed to be a comatose boy being controlled by extraterrestrials. Unfortunately, there seems to be forces working against Mulder and Scully as all their evidence disappears. Overall, a fine adaptation of the pilot episode, but nothing new to be seen, as it's pretty much copied scene for scene. The dark and surreal painted art by John Van Fleet is spectacular and fits the story perfectly. Too bad he couldn't have been the artist on the regular series. This short comic was available as a special offer in Wizard Magazine (R.I.P.) 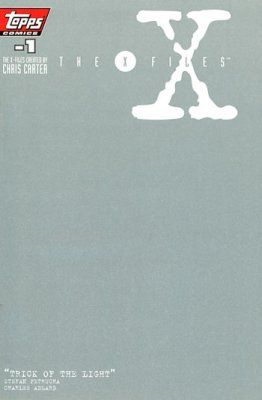 #53 about a year into the ongoing series run (around issue #12) but takes place before the first issue of the regular series. The story involves a series of murders that seem to have been committed by a comatose man. Mulder believes that he is projecting his spirit, or "Tulpa" by way of ancient Eastern mental meditation practices, but at the end of it all nothing is ever proven. This story was pretty bad. It REALLY feels like something that was rushed out to take advantage of the huge popularity (at the time) of the X-Files comics and show. The art is terrible and the colors are way too bright for the subject matter. Overall. . .weak story, crappy art, and garish colors. NO BUENO! 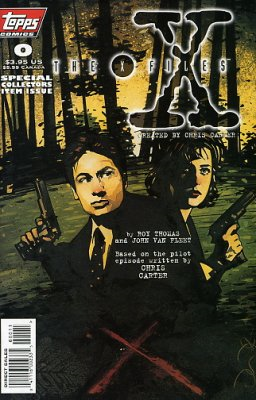 As a big X-Files fan, I was pretty disappointed with this first handful of "special" issues, with the exception of the adaptation of the pilot episode in issue 0. Even that was pretty much just a by the numbers straight copy of the T.V. script supported by fantastically strange artwork, but it was definitely the best of the bunch. The other three issues just felt like like there was hardly any effort put into them. Maybe that was the case, seeing as they were giveaways from other publications, but still. . . a huge disappointment. I can't really suggest any of these except the 0 issue to anyone but rabid X-File fans such as myself. Now that the "specials" are out of the way, let's get into the regular series. X-Files Issues 1-10. Sovereign Seven #1 1995 Comic.